I learned of Georgia Shaw’s amazing story when her daughter, Rebecca Shaw, reached out to us on the Architect of the Capitol's Facebook page. I was immediately intrigued when Rebecca said that the AOC logo had been put on Georgia's memorial plaque after she died. What I discovered, however, is that there is much more to her story. Once I had a chance to speak with Rebecca, I really understood the sense of pride Georgia felt while working for the AOC, and why adding the AOC's logo to her plaque was such an appropriate and touching memorial. While writing the story, I felt a great sense of gratitude to Georgia Shaw and all of the other women trailblazers who came before my time. I hope you enjoy learning about Georgia's remarkable journey. In 1965, Georgia Shaw's life changed forever. Just a few years earlier, Georgia had taken a job at an architect's office located in Manassas, Virginia, where she was told that she would not be paid the same as a man since a man had a family to support. Georgia, divorced with two daughters, was told she could remarry if she wanted and therefore did not need a commensurate salary. Her life changed dramatically in 1965 when she accepted a job with the Architect of the Capitol as a draftsman. According to her daughter Rebecca Shaw, Georgia "was so excited about the job. I remember her announcing it to us and how happy she was about it. She had spent so much time in college sketching federal buildings and was really fascinated with the Capitol." Georgia had decided at an early age that she wanted to be an architect. She spent a lot of time at the library, studying books about building and architectural history. When she was around five years old, a house was being built up the street from where she lived and she was absolutely fascinated. She spent virtually every day there, watching, asking questions and trying to imagine how the house would look when it was finished. 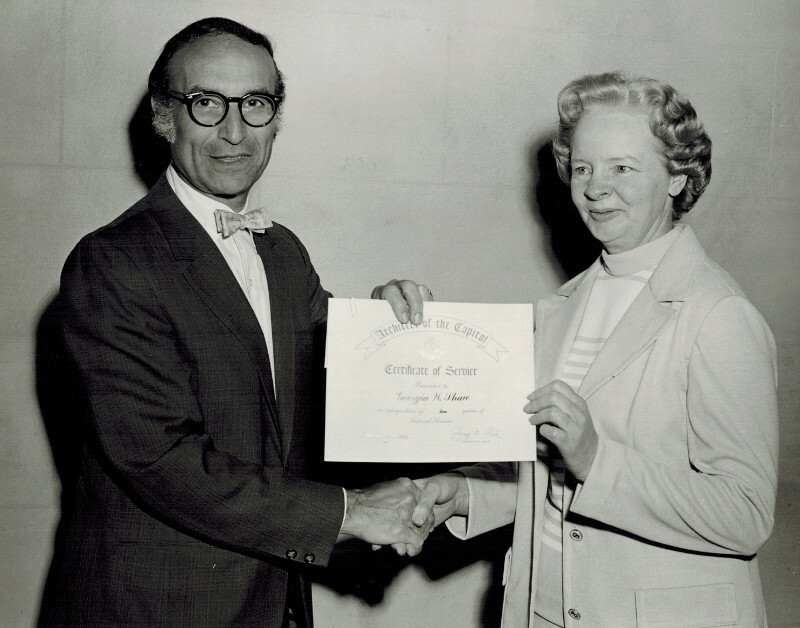 After Georgia graduated from high school in 1944 during World War II, she pursued a degree at Catholic University's School of Engineering and Architecture. 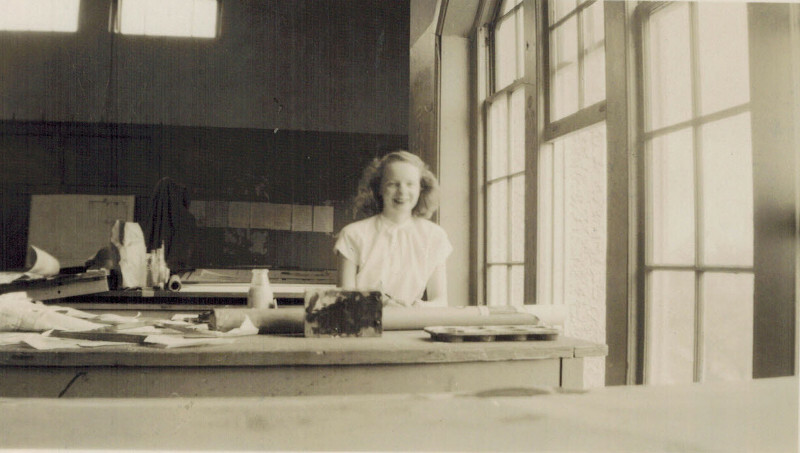 Rebecca remembers her mother explaining that at that time, colleges and universities did not often accept women into architecture programs. But with the war raging, the schools had fewer men as students and began accepting women in limited numbers. In Georgia's graduating class of 1949, she was one of three women out of a total 125 students. According to Rebecca, "college was one of the happiest times of my mother's life. She was constantly going around the city, sketching buildings and spending hours and hours at the drafting table." The job offer from the Architect of the Capitol was the fulfillment of a lifelong goal for Georgia, and she viewed it as an honor. She was, in fact, the first woman draftsman hired by the AOC, which was a nontraditional career path for women in the 1960s. Seven years later she was promoted to architectural draftsman. "My mother understood that she was a trailblazer and knew she had to do a good job," says Rebecca. "She wasn't afraid of anything, though, and she quickly became friends with the men who worked there." Architect of the Capitol George White with Georgia Shaw receiving an AOC Service Award. Letters dating from the 1970s, written by members of Congress to Architect of the Capitol George White, praised Georgia's abilities in assisting with color schemes and furniture arrangements in their offices. One such letter states: "Mrs. Shaw extended her services in a thoroughly pleasant, courteous way and her floor plan for my Annex II office is very attractive and workable." When the AOC decided to adopt the computer-aided design (CAD) and mapping system in the architecture division, Georgia attended computer training in Texas to learn the system. She came back energized by the possibilities and opportunities they afforded and enthusiastically taught it to the younger architects. In her free time, Georgia was an avid reader of all kinds of books and literature. She read The Washington Post newspaper everyday, cover to cover, until a week before she passed away. She always encouraged others to pursue their educational pursuits, whatever they might be. Rebecca remembers her mother encouraging her by saying, "I don't care what you do — just love it." On July 1, 1994, Georgia retired after 29 years of service with the AOC. Her colleagues hung a banner by her corner cubical that read "Good Luck Den Mother," which was a nickname the young people in the office used for her. She was well known around the office for having a box of windup toys in her space that fellow coworkers would play with when they needed a break. Seventeen years later when Georgia passed away after a short illness on March 6, 2011, Rebecca began planning her mother's memorial plaque that would mark her grave at the National Memorial Park in Falls Church, Virginia. There was room on the plaque to include some sort of tribute, which for some people can be a religious symbol or a favorite sports team. After some consideration, Rebecca decided to include the Architect of the Capitol's logo on Georgia's memorial plaque. "For my mother, the AOC symbolized what she had always wanted — a rewarding and fulfilling career." 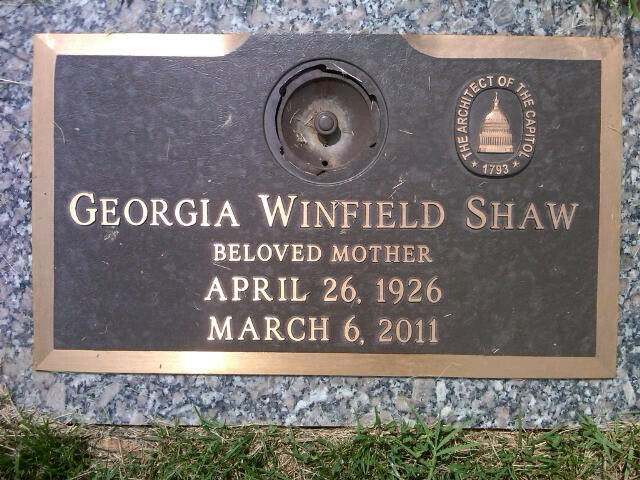 Georgia Shaw's memorial plaque with the AOC logo.